Bioretention systems are a common type of low impact development (LID) system installed in many municipalities in Connecticut. They are simple to install, as they basically are depressed landscaped areas with special soil media where runoff from impervious areas is directed to be filtered and infiltrated. While the concept is simple, the implementation often leaves a lot to be desired. The functionality of any type of infiltrative LID system is highly dependent on the ability of the natural soil to infiltrate runoff. In the case of bioretention, soil testing and location on the landscape is critical to its long-term functionality. Yet, in Connecticut it is common to find bioretention systems proposed in places where they never will function. For example, a series of bioretention cells were located next to and partially within a delineated inland wetland boundary. In addition to being located next to a soil, there were no soil tests performed near the bioretention cells. In the design of LID infiltrative practices, a comprehensive understanding of the soils in the area is critical. For bioretention systems, at least one deep test pit should be excavated to a depth a minimum of 3 ft below the anticipated bottom of the bioretention system. In addition to the deep test pit, a double-ring infiltration test must be done at the proposed bottom of the bioretention system where it meets the native soil, as this is the layer water will infiltrate into. An infiltration test conducted at the ground surface has no bearing to the infiltration rate at the bottom of the system. Figure 1 shows two bioretention systems that have become mini wetland systems in just over one year after installation. The one shown to the right has the top of the soil media 2 ft below the ground surface in the natural wetland adjacent to it. The one shown on the left is in an upland area, however, the top of the soil media is located 6 in. below when mottling was observed in the test pit. Even when deep test pits are done, bioretention systems still can be designed incorrectly. For example, a bioretention system located with the soil testing showed seasonal high groundwater at 18 in. below the ground surface, yet the bottom of the soil media was proposed 48 in. below the ground surface. A bioretention system cannot infiltrate if the bottom is located below seasonal high groundwater. The other major problem with this particular system is that it is located at the end of a 12-in. structural drainage pipe. There is no system to provide pretreatment, such as a forebay or filter strip. There also are no provisions to bypass those runoff events greater than the water quality event, which is 1 in. per 24 hours. This design will lead to sediment accumulating on the top of the infiltrative soil media, clogging it and causing premature failure of the system. The upland plant species in the bottom of the bioretention system have died because they were in a saturated condition for an extended period, which they cannot tolerate. Most upland plants will tolerate ponding for a maximum of 48 hours; ponding beyond that can cause them to die. The designer must evaluate where the bioretention system should be located on the natural land form. Ideally, these systems are most effective when located on mild slopes with deep, well-drained soils. The designer can use the U.S. Department of Agriculture’s Natural Resources Conservation Service Web Soil Survey to get a preliminary idea of the soil conditions on the site. As the designer begins the process of laying out the proposed development concept, they can make preliminary determinations for the location of bioretention system within the framework of the development plan. At this point, the designer must perform both deep test pits and double-ring infiltration tests in all proposed bioretention systems prior to designing the system. 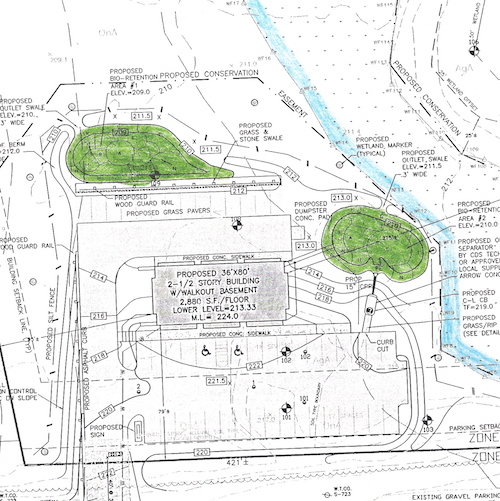 After the designer has determined the required storage volume for water quality treatment for the bioretention system, they should lay out the system on the site plan in accordance with the design requirements in their state. At a minimum, a 12 in. vertical separation from the bottom of the soil media to seasonal high groundwater should be provided, so that there is an unsaturated zone where the runoff can infiltrate. Once the sizing and design have been completed, the next steps are critical to the actual design implementation. Clear, concise construction details and specifications must be provided on the site plans so the contractor can follow them. It also is imperative that the design specifies short- and long-term maintenance requirements, which the end user can perform to ensure that the system functions as intended. It is important that the designer inspects the installation of the bioretention system during the various stages of construction. After the system has been installed, the designer must certify that the system was installed in compliance with the plans. With this approach, bioretention systems will function properly, provide water quality improvements and reduce runoff volumes. Steven Trinkaus, P.E., is a licensed professional engineer for Trinkaus Eng. LLC. Trinkaus can be reached at 203.264.4558.